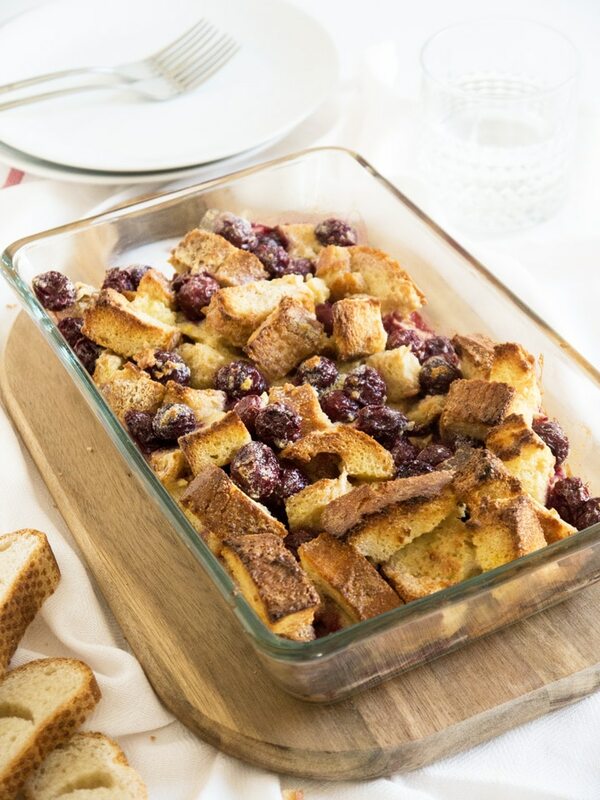 Cherry French Toast Casserole is a perfect breakfast for the weekend! Made with delicious cherries and baked in the oven. 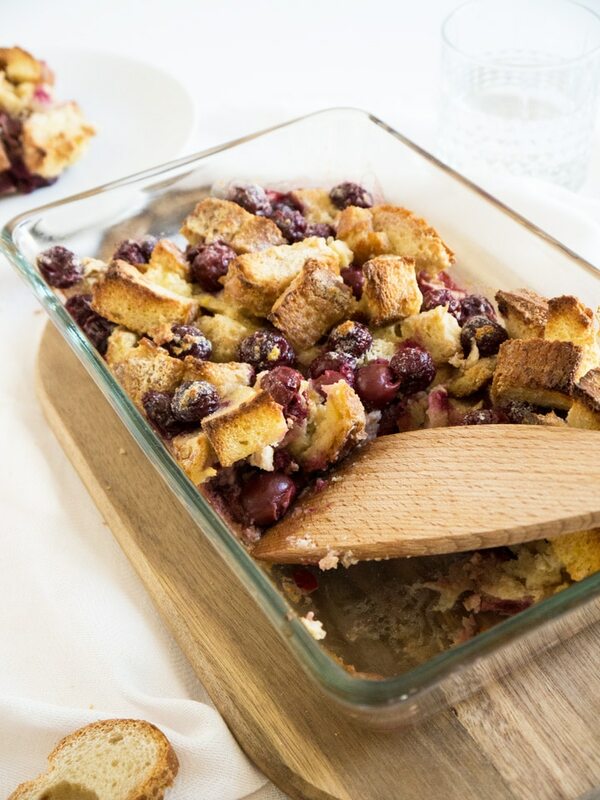 There is no better word than “extra delicious” to describe this Cherry French Toast Casserole. 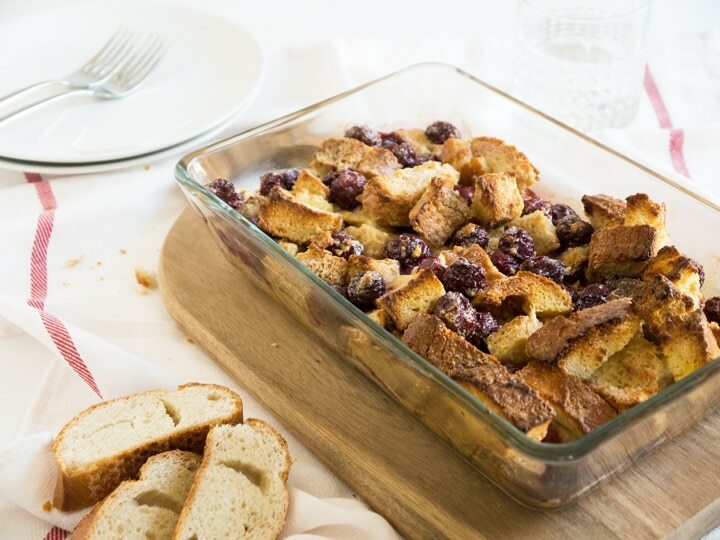 Perfect recipe to use leftover bread! My grandmother used to make this dish for lunch when I was little and it is still one of my favourites. In Germany, it is known as “Kirschmichel”. Today this is my go-to recipe for brunch or breakfast. 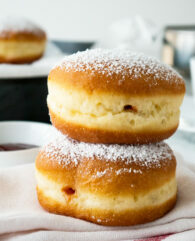 Made with crusty bread chunks, cherries and an egg-y custard mixture on top. I promise it will make everyone at your table happy! 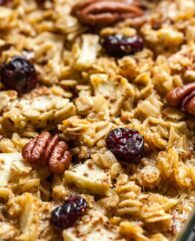 This casserole is my definition of sweet comfort food, toss everything in a baking pan, put it in the oven and you’re good to go! 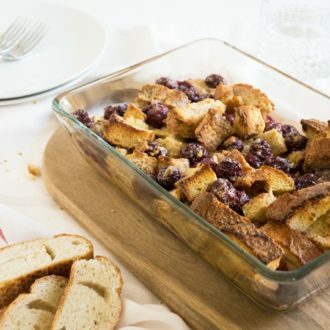 I used leftover french bread from Christmas Eve for this Cherry French Toast Casserole but you can use any kind of crusty white bread like challah bread. The bread should be stale (2 days old or more), so it can better absorb the custard and the bread on top will give you a nice crunch which I love. 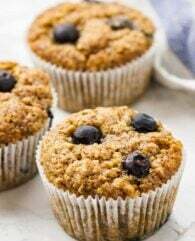 Perfect for a weekend breakfast! And if you want something savoury I recommend my Cheesy Mexican Toast Cups! Preheat your oven to 370°F and grease a 7"x11" sized baking pan. Cut the bread into bite-sized pieces and put it into the pan. Pour the tepid milk on top and let it sit for 10 minutes. Beat the egg whites until stiff and set aside. Mix the butter, egg yolks and sugar together until the mixture becomes fluffy. Fold the egg mixture, the stiff egg whites and the drained and pitted cherries into the bread and milk mixture. Sprinkle some butter on top and bake for 40 minutes. This recipe can easily be doubled and baked in a larger pan. The bake time will be slightly longer. Day-old bread with a nice crust is perfect for this recipe. Cut your fresh bread in chunks and let sit out overnight. Instead of cherries, try strawberries or blueberries. Apple slices will be perfect, too. This is so my kind of brunch! So comforting and delicious! This sounds like a really unique take on French Toast. We’ll have to give this one a shot! Oh I think my husband would get a kick out of this. He loves cherries and french toast. Inspired to try em out! Thank you so much, Fareeha! I was just thinking I needed a recipe like this! French Toast meets brunch! Pinned!